From the taste and freshness of the food to the decor and cleanliness of your facilities, what your customers see and experience during their time in your restaurant will ultimately determine how likely they are to return. 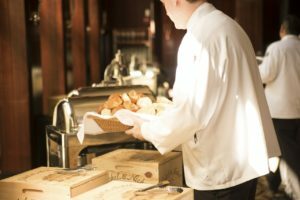 There are several factors in your business that can contribute to the reputation of your restaurant. From the taste and freshness of the food to the decor and cleanliness of your facilities, what your customers see and experience during their time in your restaurant will ultimately determine how likely they are to return. One major factor of a restaurant reputation is the cleanliness and presentation of your employees as they are working. Consider the many ways in which the physical appearance of your team correlates with the reputation of your restaurant amongst your customers. Why might the personal hygiene of your employees matter to your customers? The answer can be found directly in the preparation of their food. As your customers look around the restaurant and see your servers, line cooks, and hostesses working around their food, the sight of clean uniforms provides them with a reassurance that your employees are working with clean hands and best practices for hygiene in your restaurant. In addition to assuring your customers that their food is being safely and hygienically prepared, a clean and well-maintained uniform also has many implications for the state of your kitchen. This frequently made connection is why attention to detail is so crucial in this particular industry, as customers are always connecting the quality of various aspects of your business. With this, if a customer notices that an employee is not well presented, it may also lead them to believe that your kitchen is equally unorganized or neglected. Because your employee uniforms are such a significant display of your brand, your customers will ultimately connect the appearance of your brand on employee uniforms with the level of service that they receive at your business. With this, it is not only important to ensure that your employees look professional and polished as they are working, but also to ensure that they are providing excellent service while doing so. Let these two positive facets of your business work together to help you build an excellent reputation for your restaurant so that customers can confidently recommend your services to others in your community. This entry was posted on Friday, July 27th, 2018	at 9:31 am	. You can follow any responses to this entry through the RSS 2.0	feed. Both comments and pings are currently closed.